Chicagoans speeding along Lake Shore Drive at Foster Avenue might be surprised to know that beneath the roadway lie the ruins of a signature piece of Chicago’s lakefront, designed by the same guy who co-wrote the Chicago Plan of 1909, drew the plans for the bridge across the river on Michigan Avenue, and gave the city the plans for the unbelievable Buckingham Fountain. 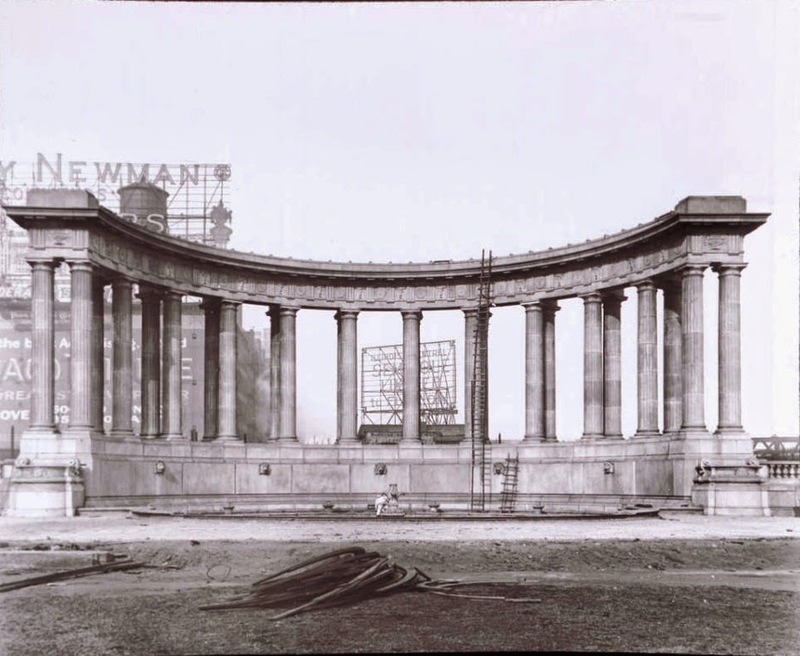 It was on this day, February 20, of 1953 that the Speedway Wrecking Company took 55 minutes to demolish the Edward H. Bennett-designed peristyle at Michigan Avenue and Randolph Street to make room for construction of the Grant Park garage. The debris was trucked north and used as fill for the north section of Lake Shore Drive. 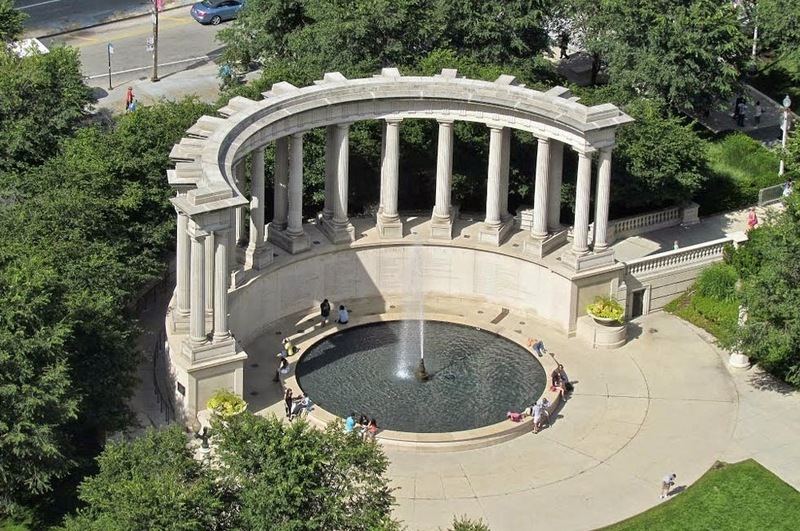 The peristyle that Bennett designed was in keeping with Daniel Burnham’s concept of the lakefront park as Chicago’s grand garden, designed in the classical tradition. Unfortunately, the 1917 design was executed in concrete, so enduring steamy summers and icy winters while standing on the edge of a railroad freight yard was more than the monument could stand, and by 1953 it was beyond saving. When the plans for Millennium Park were drawn up in the late 1990’s, the brilliant idea of replacing the peristyle became part of the plan. David Dillon and Michael Patrick Sullivan of OWP&P used the original drawings from the Chicago Park District’s archive to re-envision the monument. The 24 columns that make up today’s peristyle are the same height as the original peristyle’s columns. The diameter of the monument was reduced slightly, from 100 to 80 feet, in order to accommodate an accessible ramp that runs behind the structure. Constructed of Indiana limestone, it should stand the test of time. The William Wrigley, Jr. Foundation contributed the five million dollars it took to recreate the peristyle. The pedestal on which it stands holds the names of 115 financial donors who made contributions of at least one million dollars toward the completion of Millennium Park. There are two unique features of the modern peristyle that many passers-by overlook. The brass spout of the fountain in front of the monument was cast from a mold of a terra cotta finial that stands atop the Wrigley Building three blocks to the north. 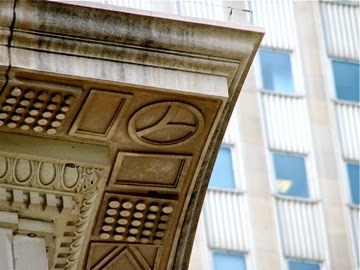 And if you follow the outermost columns up to the top of the colonnade, you can find Chicago’s ubiquitous “Y” symbol in the corners. 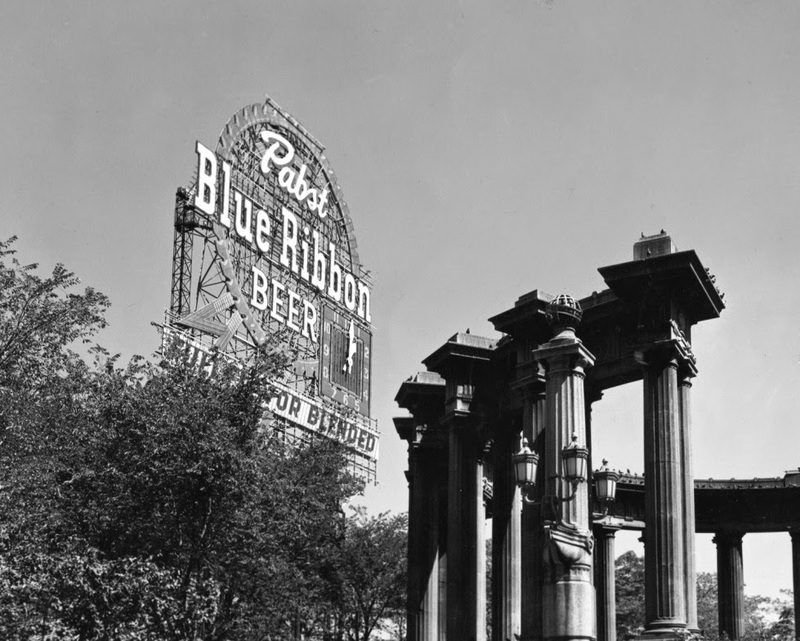 Curiously enough the northwest corner of Michigan and Randolph, the loation of the original peristyle and the site where that monument was rebuilt, was the place where the team that would eventually become the Chicago Cubs first played baseball. The team has yet to be rebuilt.